A super quick, five-ingredient recipe that's quite a unique twist on the traditional appetizer spread. 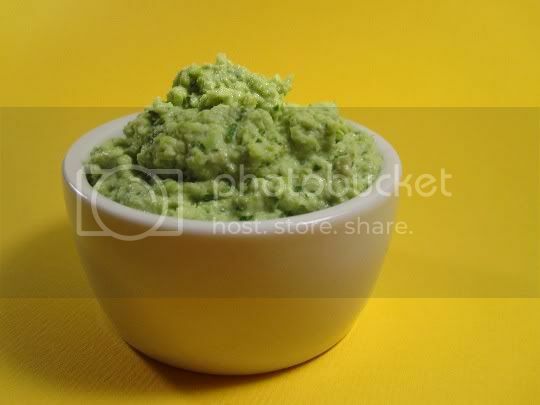 Edamame, parsley, garlic, tahini, lemon juice, and a little water are blended until smooth in a food processor. The recipe suggests adding salt to taste, but you really don't need a lot, as the tanginess from the lemon juice is more than enough oomph for your taste buds. I did add a little though, about 1/8 teaspoon. Interestingly enough, I couldn't really decide if I liked this after my first few bites. It's definitely a unique taste. It has more flavor than the traditional chickpea-based hummus: tangy lemon juice, bitter tahini and parsley, pungent garlic...and then the edamame adds just a hint of sweetness. But it's the pungent and bitter flavors that you'll taste the most, and it gets strangely addictive after a while. This hummus would be best served with mildly flavored bread or crackers to get the full flavor effects. Make again? Maybe. I like the uniqueness of the recipe, but I have a feeling it might be an acquired taste.